WhatsApp bug is deleting chats: 2019 hasn’t started on a great note for Facebook-owned messaging platform – WhatsApp. Within three weeks, the company finds itself in another controversy as a bug has been spotted by Android users which is allegedly deleting their old chats. Many WhatsApp users took to Twitter and claimed that their old messages were being deleted without any notification. The bug was initially spotted last year but the company had not made any official announcement regarding it. A Twitter user named Bharat claimed that his WhatsApp messages were vanishing mysteriously. Bharat said that his messages were getting deleted every morning. Bharat said that he is using a Moto G4 Plus Android smartphone. His tweet was even shared by WABetaInfo. “I am facing the issue from June 2018. I am losing very important old messages. I sent too many emails to WhatsApp, now they stop responding me. I tried everything including reset phone, different WA [WhatsApp] version, changing phone, but no use [sic],” another affected users posted on Twitter. Remedy: How to save your WhatsApp chats? Even though there is no official statement from WhatsApp on this, the messages could be vanishing because of the company’s partnership with Google under which all WhatsApp backups will get stored in Google Drive. 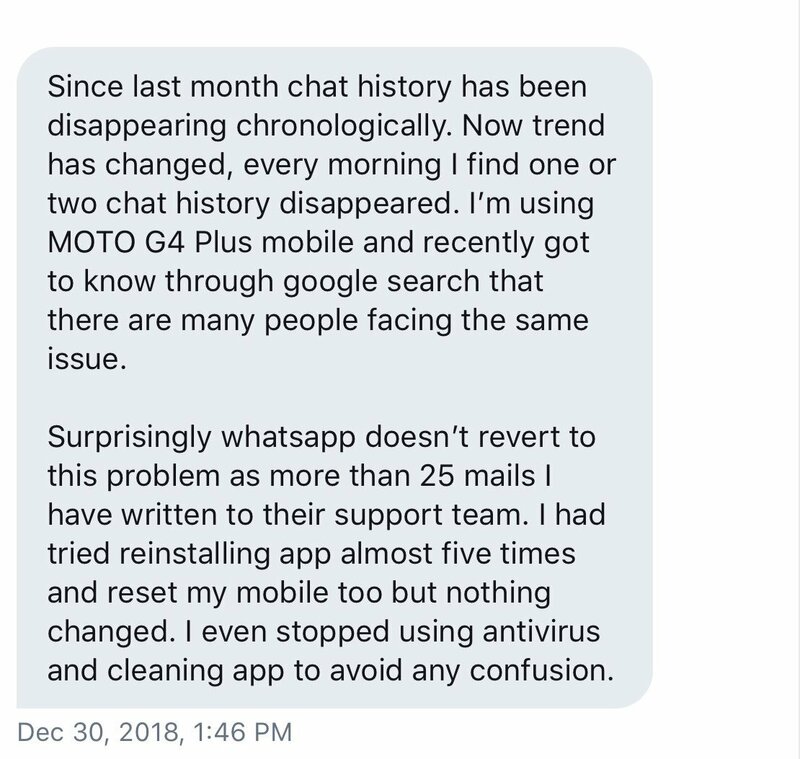 While announcing the partnership, WhatsApp had said that chats not backed up for a year or more will be deleted automatically from Drive. To save the chat, WhatsApp users can back up their data. To do this, they need to open the app on their smartphone and open menu. In settings option, they need to open Chats and click on Chat backup. An option to back up data on Google Drive will appear. The users need to select a frequency to backup the data. The process can also be completed manually in every few days.